The Torquay hotel that inspired John Cleese and Connie Booth to create Fawlty Towers is being demolished. The Guardian reports that retirement flats will be built in its place. Cleese and Booth starred in the BBC Two sitcom with Prunella Scales and Andrew Sachs. Fawlty Towers ran for two non-concurrent series (seasons) in 1975 and 1979. Speaking last year to the local paper, the Herald Express, Cleese said he had long had an affinity with Devon. He used to visit with a school friend and they would play crazy golf and watch Torquay United. Michael Palin recalled that Donald Sinclair ‘seemed to view us as a colossal inconvenience’, while his wife threatened them with a bill for a stay of two weeks even though they had checked out quickly. ‘But off we went with lighter hearts’, Palin added. 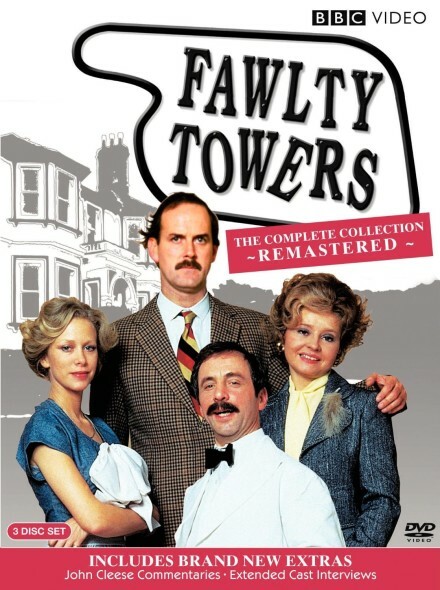 Fawlty Towers ranks number one on the British Film Institute list of best British TV shows: BFI TV 100. The institute compiled the list in the year 2000. The series has run on PBS affiliates in the US. It is available on DVD, iTunes, Seeso, and sometimes, on Netflix . What do you think? Are you a fan of the Fawlty Towers TV show? Would you like to see it revived? More about: BBC Two TV shows: canceled or renewed?, Fawlty Towers, Fawlty Towers: canceled or renewed?, PBS TV shows: canceled or renewed? One of the funniest comedies ever shown on tv. Don’t raze the structure, put it in the tv hall of fame.